Dropmore House is a large detached late eighteenth century mansion which stands in its own estate of 220 acres. It is located in the Thames Valley near to the wood known as Burnham Beeches. The house is approximately 22 miles from central London and 3 miles from Beaconsfield in Buckinghamshire. The Burnham/Taplow parish boundary passes through the house which is Grade I listed. 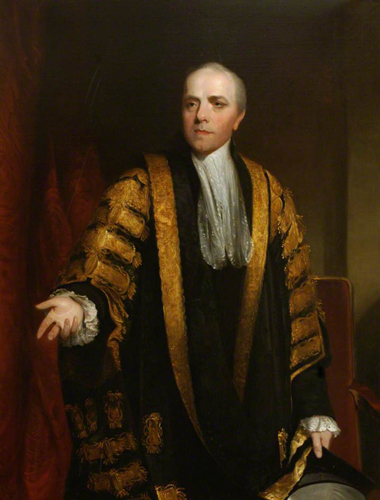 Lord Grenville, Prime Minister to George III, bought the land in 1792 and employed Samuel Wyatt to build the south range of the present house. Grenville began landscaping Dropmore immediately after he built the house, and his improvements are said to have included the removal of a hill that blocked the view of Windsor Castle 10 miles to the south-east. He was a keen botanist, and planted many trees, some supplied by his brother Lord Buckingham from Stowe, including, in the 1820s, a Pinetum west of the house, around the lake. Grenville died in 1834, leaving his widow, also a keen botanist, who continued to develop the estate and gardens, constructing the alcove by the lake, and probably the Italianate features in the walled garden. Further work was undertaken on the house between 1806-1809 when Charles Tatham was employed to carry out some alteration. Following Lady Grenville’s death in 1864, aged ninety-one, the estate passed to Lady Grenville’s nephew, George Matthew Fortescue. Under the Fortescue ownership the estate increased in size as they bought more land. It passed to George’s son, Cyril Fortescue, in 1877. He died in 1890 and it passed to his younger brother John Bevill Fortescue. It appears that he and his family spent the winter at Boconnoc and the summers at Dropmore. John Fortescue employed Detmar Blow and Fernand Billerey to re-design the main house and outbuildings during the first decade of the twentieth century. When he died in 1938 the death duties on all of the Fortescue’s estates were so large that his son George Grenville Fortescue was forced to sell the house. The house was requisitioned by the War Office in 1940, and bought in 1943 by Lord Kemsley, the newspaper owner. Following its occupation by the Army and the consequent deterioration of the house and grounds, the Kemsleys took up residence in 1948 when the programme of restoration and enhancement both inside and out was completed. It is assumed that this was the period when the garden buildings were altered. The Dairy and Aviary pavilion were shortened to the structures that we see today. This may have been due to the neglect suffered by them during the war years and the fabric that was thought beyond restoration was removed and that which could be saved was restored. 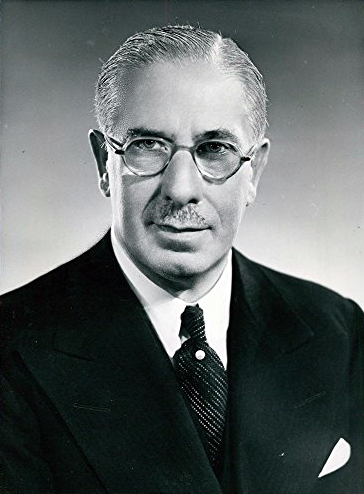 After Lord Kemsley’s death in 1968 the house was sold to United States International University and then to the Ambassador of the United Arab Emirates, Muhammed Mahdi al-Tajir. In 1990 it was badly damaged by a fire that took four days to put out. Another fire in 1997 left the house uninhabitable. Much of the garden has subsequently been vandalised and many structures have been stolen. The site is currently being restored by new owners. Dropmore House is of two storeys, built in the Classical style. Originally the structural brick walls were faced in Wyatt’s prefabricated slate sheets. The slate was pre-cut in his Berwick Street Mill in London. According to Dr John Martin Roberton’s account of the history of Dropmore: ‘the slates were screwed flush onto wooden battens set in ‘oil cement’. The external slate was painted to resemble Bath Stone; with Stone ochre oil paint and fine sand. It has a slate roof. The house has a central single-storey portico on the north, entrance front, and on the south, garden front three bows with shallow domed roofs. The ground floor garden front supports a wooden trelliswork pergola at the west end, with arched openings in front of each window; it used to support an enclosed verandah in similar style at the east end but that has since gone. The house was seriously damaged when burnt out in 1990, leaving only the west portion standing. Next to the west elevation of the house stands a modern house on the east side of a walled service court, with, on the south wall of the court, a small lean-to building with an overhanging slate roof, supported on decorative iron trelliswork pillars. The severe, early nineteenth century red-brick stable court closes the west end of the service court, with two low towers flanking brick gate piers separating the two courts, the main entrance from the rear drive entering through a tall arch on the north side. The formal gardens lie west of the house, divided into two main areas, to the north and south, by an angled brick wall running from west to east which supports a long pergola on its south side and bothies on the north. The south garden, laid out with formal gravel paths dividing it into rectangular sections of lawn, contained various stone features which have since been stolen. One path runs parallel with, and adjacent to, the south side of the wooden pergola, the main feature in this garden, which is punctuated by the wire Aviary which lies next to the wall, just west of the house. The east end of the pergola is constructed of painted wooden trellis work, continuing the arched pattern begun against the garden front of the house, punctuated by two brick and slate-roofed garden lodges with Doric columns, entablature and pediment all applied in wood. These were the Dairy, to the east, and the Gardener’s House (Aviary pavilion) to the west. Beyond the west end of the section there stands the Aviary. 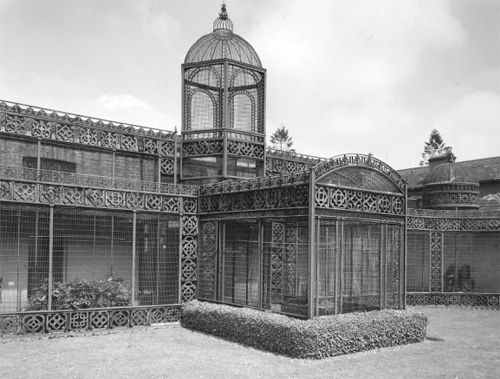 The Aviary is a cast-iron cage, with ceramic tiles imported from China around the base, these also forming the uprights and frieze. It has three projections with cupolas, the central of which is higher than the other two. The Aviary’s architect and date of construction are unrecorded, but John Buckler’s sketch dated 1830 appears to be very accurate, as are his sketches of the rest of the estate. 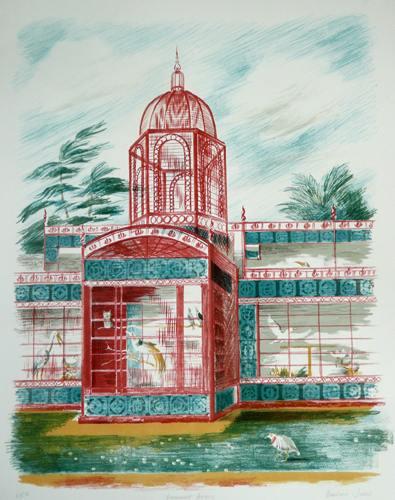 It is thought that the Aviary was last painted in the post-war period by Lord Kemsley, who also replaced some of the missing Chinese tiles with cementitious cast ones. It is listed Grade I. The grounds also contain a number of other features including the Pinetum which once contained the biggest collection of conifer species in Great Britain. It also has a circular Grotto built of large blocks of broken concrete with an entrance arch of large stones, possibly material from the old London Bridge. Close to this is the Dog’s Tomb, a carved stone sarcophagus with decoration and an inscription, containing the remains of Lord Grenville’s dog Tippo. North of the garden wall, the walled (or Italian) garden runs parallel with the south garden, divided from north to south by a central path aligned with a pedimented archway in the garden wall giving access from the south garden. This path is flanked by yew hedges, with the remains of stone balustrade at the north and south ends, aligned on a ruinous raised stepped feature at the north end, which had a small pool within it. This stepped feature lies at the centre of the broad straight path running along the north side of the Italian garden on a terrace above the rest of the garden, with a three-bay Italianate loggia at the east end. The Italian Fountain is said to contain original pieces of Roman architecture including a Roman bath from 1500AD brought to England from Rome. The walled garden is largely laid to lawn, with an informal oval pond dominating the eastern half; much of its former ornamental stonework is missing. This area appears to have been the kitchen garden in the nineteenth century, surrounded by the ornamental structures and borders. 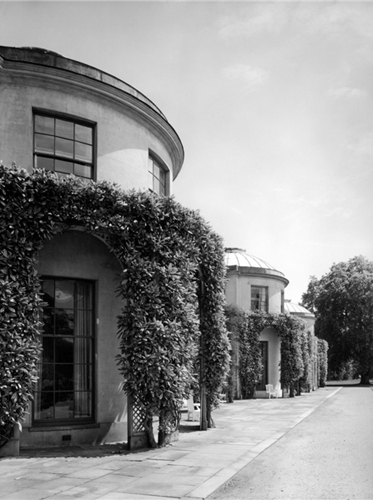 Lady Grenville’s gardens and conservatories were noted for their collection of exotic plants. When John Loudon visited her in 1827 her flower garden outside the library was famous, consisting of a geometric parterre, each bed planted with a separate strong colour achieved by massed planting with a succession of species. Loudon praised Dropmore where Philip Frost,2 the innovative head gardener of the 1830s and 1840s, seemed to have best demonstrated ‘the advantage of placing beauty in masses’. I was asked to investigate the history of the decoration of the Aviary. Much has been taken from the Heritage Statement produced by Giles Quarme & Associates architects. 1 Anne was the daughter of Thomas Pitt, 1st Lord Camelford, and had been brought up at Boconnoc. 2 Frost moved to Dropmore to become Head Gardener from Boconnoc, but left in 1826 to go to Ashstead Park. I was interested to read this article as my 3x Great Grandfather, Jeremiah Abbott, was described as ‘carpenter to the late Lord Grenville of Dropmore in the parish of Burnham Bucks’ in his obituary in 1834. I wonder if he had a hand in any of the buildings described? Thank you Lesley. How interesting. Sadly my only work was on the aviary and I didn’t come across names of the tradesmen and specialists involved in the house itself. Very interesting reading. My cousin Desmond Fortescue who, now in his 90′s and still living at Boconnoc, would be fascinated to know how the restoration is progressing at his beloved childhood home. I am only sorry that I was not able to tell Anthony about that project. Great to see this. 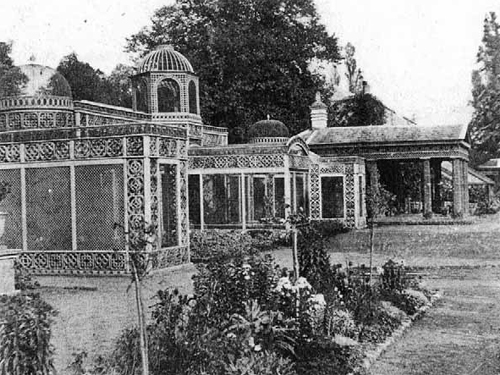 There was, and perhaps still is, a ‘tea house’ at Dropmore as well, a kind of garden room decorated on the inside in ‘Royal Pavilion’ Regency chinoiserie style. It may have been constructed at about the same time that the Chinese House at Wotton (now at Stowe) was repainted in a similar style. Wotton would have been lived in at that time by Lord Grenville’s nephew, the eldest son of the Duke of Buckinghamshire, and presumably they were all aware of each other’s projects. Great colour scheme: red and blueish green! Thanks Emile. How fascinating. Sadly I had no opportunity to explore the site while I was there. Lots of activity with bulldozers and the like. There was no mention of it, sadly. Hi Patrick – there is a property on the corner of the estate (next to the Dropmore School) that I’ve wanted to restore for years. Do you know who maintains the estate these days that I could contact? Thanks Joe. Sorry. I have no idea. It was one of those jobs where I drove to site, took the samples and wrote the report. Little involvement otherwise.